New research from physicists working at CERN’s Large Hadron Collider shows evidence of leptons acting out against time-tested predictions, suggesting that subatomic particles may defy the Standard Model. The Standard Model of particle physics, which explains most of the known behaviors and interactions of fundamental subatomic particles, has held up remarkably well over several decades. This far-reaching theory does have a few shortcomings, however—most notably that it doesn’t account for gravity. In hopes of revealing new, non-standard particles and forces, physicists have been on the hunt for conditions and behaviors that directly violate the Standard Model. Now, a team of physicists working at CERN’s Large Hadron Collider (LHC) has found new hints of particles—leptons, to be more precise—being treated in strange ways not predicted by the Standard Model. The discovery, scheduled for publication in the September 4, 2015 issue of the journal Physical Review Letters, could prove to be a significant lead in the search for non-standard phenomena. The team, which includes physicists from the University of Maryland who made key contributions to the study, analyzed data collected by the LHCb detector during the first run of the LHC in 2011-12. The researchers looked at B meson decays, processes that produce lighter particles, including two types of leptons: the tau lepton and the muon. Unlike their stable lepton cousin, the electron, tau leptons and muons are highly unstable and quickly decay within a fraction of a second. According to a Standard Model concept called “lepton universality,” which assumes that leptons are treated equally by all fundamental forces, the decay to the tau lepton and the muon should both happen at the same rate, once corrected for their mass difference. However, the team found a small, but notable, difference in the predicted rates of decay, suggesting that as-yet undiscovered forces or particles could be interfering in the process. The LHCb result adds to a previous lepton decay finding, from the BaBar experiment at the Stanford Linear Accelerator Center, which suggested a similar deviation from Standard Model predictions. (The UMD team has participated in the BaBar experiment since its inception in 1990’s.) 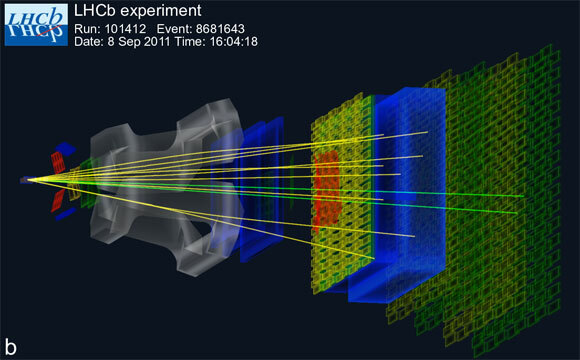 While both experiments involved the decay of B mesons, electron collisions drove the BaBar experiment and higher-energy proton collisions drove the LHC experiment. “While these two results taken together are very promising, the observed phenomena won’t be considered a true violation of the Standard Model without further experiments to verify our observations,” said co-author Gregory Ciezarek, a physicist at the Dutch National Institute for Subatomic Physics (NIKHEF). With the discovery of the Higgs boson—the last major missing piece of the Standard Model—during the first LHC run, physicists are now looking for phenomena that do not conform to Standard Model predictions. Jawahery and his colleagues are excited for the future, as the field moves into unknown territory. 4 Comments on "New CERN Study Suggests Subatomic Particles Could Defy the Standard Model"
Subatomic particles are the derivative of subatomic fields which are mathematical curves of different ‘frequencies’. Move a line segment to the left an inch and the other end of the line segment moves to the left one inch. yes, it should defy the Standard Model, simply because Particles Field will tell more about and tell all about subatomic Particles those will defy Standard Model and those cannot be found by the Standard Model or any institute in the world!!!!!!!!!!! Standard Model only found about 17 Particles Models with manner of Blinds touch up the elephant, in mean of time, the number might be even up to Millions . . . . . . . . . . . .
Now you can see how far behind or so wrong about the Standard Model!!!!!!!!!!!!!!!!!! The decaying of sub atomic particles in two different ways only led to the excess of electrons over antimatter. Eventhough it is in a microscopic fraction, it finally led to the formation of this Universe where anti-matter world is never seen. The annihilation of matter with anti-matter is automatic in this world at the birth itself. What forces come into play to decay in two different ways with excess of stable matter is a reason to find out. Thank You.